People don’t go out and exercise in order to look like other people. They do it to stay healthy, feel good and look good. And they like to wear things that make them look and feel good while they are doing it. But there was Andrea Kuchinski ’06 once again, buying a frumpy men’s T-shirt to wear at the gym because there were no nice workout clothes in her size. And Kuchinski can tell you wearing that kind of T-shirt to the gym definitely does not feel nice. That day was especially harsh because the friend she shopped with, a size 4, came away from the large sporting goods store with a whole pile of cute, stretchy clothes. Kuchinski, a CrossFit competitor capable of deadlifting 320 pounds, is not just a creative and funny athlete. She is inherently proactive. She made that dowdy T-shirt her last, found a manufacturer to sell size 2XL tank tops in 10 colors and a printer to add sayings to the shirts. And that is how, in 2013, Thick to Thin was born. The company, which is web-based, has $500,000 in sales under its belt. It is poised to hit the $1 million mark this year. Thick to Thin (T2T) sells a rotating line up of soft tank tops, T-shirts, sweatshirts and workout pants priced at $27 to $42. 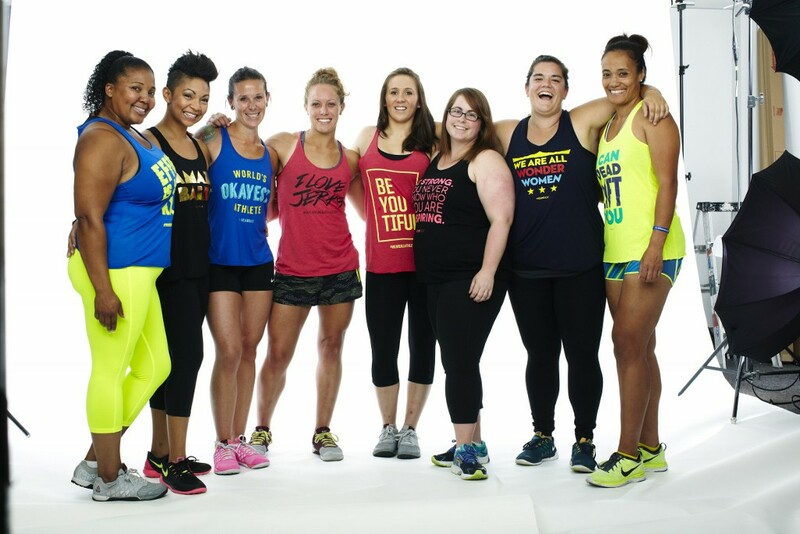 Instead of sporting a company logo, as Under Armour and Nike do – “Why be a walking advertisement for them?” Kuchinski states – T2T customers choose what they want to say when they hit the weights and elliptical trainer: “Stronger than the Boys,” “Strong is the New Skinny,” “Me Against Myself” are among the slogans they can select. Kuchinski cycles them out and adds new ones. And, instead of appealing only to the ripped athletes that some brands market to, or the plus-sized shoppers targeted by some large retailers, T2T clothing comes in sizes XS to 5 XL. The website makes this clear, featuring an array of women you might actually see at the gym. Andrea Kuchinski: motivating women to stay fit, look good. “We are all athletes,” reasoned Kuchinski, a basketball and soccer player in high school. Born in Owego, Tioga County, she gravitated toward graphic design from an early age. At Saint Rose, she learned to conceptualize her ideas and understand herself. Kuchinski is especially grateful to Professor Ann Breaznell and to the late Karene Faul, founder and longtime chair of the College’s art and design department, for their kindness. “Karene embraced everyone for their individual selves and I always felt I could connect with her,” she said. After graduating, Kuchinski joined a few design firms in the Washington area. Her big name clients included GEICO and the NFL. As her career advanced, though, she gained weight she found difficult to lose. Kuchinski also found it increasingly difficult to get herself to the gym. To get moving, she began writing a blog about her weight control struggle and was surprised when a community of readers gelled around her words. They often told her they felt the same away. “I wasn’t super coy about what I was saying,” she noted. The Washington Business Journal saw the blog and wrote a story about Kuchinski. Next, Kuchinski published her op-ed in The Washington Post about the day her friend left the sporting goods store with tiny yoga pants and she left, in tears, with the T-shirt from the men’s section. The Chicago Tribune and Fortune magazine picked up the piece. Rather than respect the active women who don’t fit the 4 to 14 size range, she cited retailers who charge more for larger clothes or who simply make the same clothes bigger rather than proportion them. Some labels, she noted, even flaunt their exclusion of large women by saying “not all bodies are suited” to their apparel. The national publicity catapulted Thick to Thin sales and brought inquiries from prospective investors. Kuchinski recently replaced an outside manufacturer with her own distributor, a step, she hopes, toward the day when she draws an investment partner. Along the way, the experience has had a strong influence on her own thinking.